These best San Diego museums are world class with interactive exhibits, guided tours, beautiful settings and facilities. Apart from being a surfer's and baseball paradise, the sunny city of San Diego offers a fascinating choice of Museums. Ranging from all things automotive to shipping, fine art, folk art, music, railroads and more, there is something for everyone. Learn about and explore the world we live in! You will be amazed at how easy and how much fun it is to explore modern day museums. Ship lovers have to get down to the Navy Pier at the harbor to explore the USS Midway Museum. 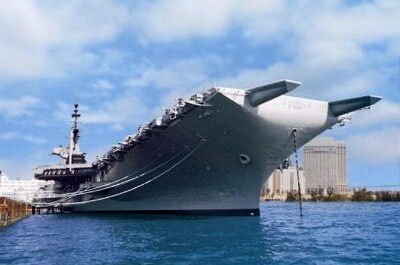 It is a San Diego Museum that is located inside a ship by the same name, the USS Midway, floating on the water! Between the years 1945 to 1991, the USS Midway was one of the Navy's flagships. Be awed by the size of the vessel as you approach and then enter to explore over 60 exhibits and a fabulous collection of aircraft. Walk through the engine room, the ship's brig and see the sleeping quarters used by the crew. Explore the upper decks which are a myriad of narrow corridors taking you to the Admiral's War Room and the Control Tower. See an F-14 Tomcat, a jet fighter, an F-4 Phantom and an A-7 Corsair from so close you can even touch them. If you want to be hands on, experience the flight simulators. Then watch videos, films and take part in interactive exhibits. The kids will be thrilled at the Ejection Seat Theater. Make sure you buy a souvenir from the gift store to take home. The Museum has a lot of stairs to navigate, so be prepared. 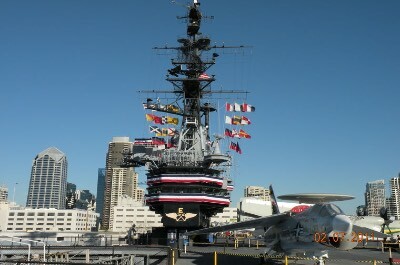 After visiting the USS Midway Museum, set off to see some more amazing ships at the Maritime Museum of San Diego. This San Diego Museum is world famous and will inspire your imagination as you travel back in time to the days sailing the seas in Tall Ships. The main attraction is the awesome Star of India, the world's oldest active merchant ship. This massive iron monster was built in 1863 and towers into the skies with three huge masts. 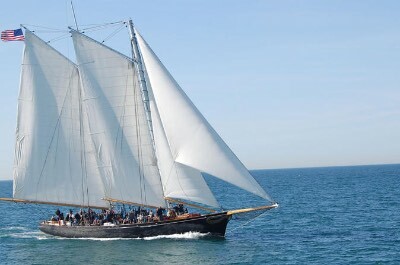 Take a guided tour with a professional guide and explore the Tall Ships, experience what is like to live and work inside a submarine and learn about yachts and harbor boats. The Museum has many special events and you can rent a charter boat to sail out onto the water or even enjoy a specially booked themed party for your group. The gift store sells meaningful souvenirs like caps, keyrings and mugs that you can use at home as a reminder of this special visit. After your day exploring Tall Ships, head off to the San Diego Air & Space Museum to learn all about aviation and space exploration. It makes an awe-inspiring outing for the whole family. Learn how the history of aviation has changed over the years, from 1911, when pilot Calbraith Perry Rodger completed the first transcontinental crossing of the United States in an airplane, taking 82 hours. Today, commercial jets take under 5 hours. See a fabulous reproduction of the actual plane, called the Vin Fiz Flyer, that was used on this historic flight. Then explore a replica of Charles Lindbergh's famous Spirit of St. Louis. See the Museum's collections covering the Dawn of Flight to today's latest innovations. Become an astronaut as you take part in an interactive experience. The kids will be delighted to discover the 3D movie theater that offers thrilling movies from the air and then they can get their hands on the joystick in the simulator of an F15. This is a San Diego Museum that must be on your to-visit list! As you approach the San Diego Museum of Art, you will be awed by the faade - a stunning art creation and an intro to the fabulous exhibits that are held within the building. Located in Balboa Park, the architecture of this exquisite building was inspired by the Cathedrals of central Spain. Inside, you will see an extensive collection spanning 7000 years of art. The exhibits cover classic paintings by European masters to a fascinating display of South Asian art. Wander around and see the works of iconic artists like Francisco de Goya, El Greco and Henri Matisse. See art from around the globe, including stunning collections from China, Mexico and Quebec. If you enjoy photography, this San Diego Museum has a magnificent display from the world's best photojournalists. The displays are always changing, you can visit again and again and never get bored. 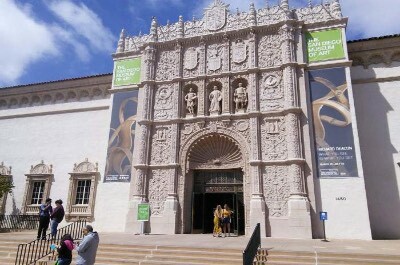 This is the largest and oldest Museum of its kind in the region and must be on your list of things to do in San Diego. Model railroads can keep you mesmerized for hours as you watch the tiny trains run around the tracks and the San Diego Model Railroad Museum is the perfect day outing for the whole family. Set off to Balboa Park and discover 27000 square feet of model trains! Here, the allure of locomotives will thrill as you watch a train navigate the treacherous Tehachapi Pass, or travel the Pacific Desert Line, a track that was planned to stretch from San Diego to the east coast but was never built. Be awed at the meticulous attention to detail and the amazing scenery as trains move across Alpine passes, bridges, lush countryside and through barren landscapes. Learn all about the era of travelling across the USA by rail, a time now mostly forgotten. If you visit on Tuesday or Friday nights, you will treated as you watch model makers busy at their craft. Kids will love Thomas the Tank and the whole family can learn about railroad signs and railroad light language, born long before the advent of the telephone. 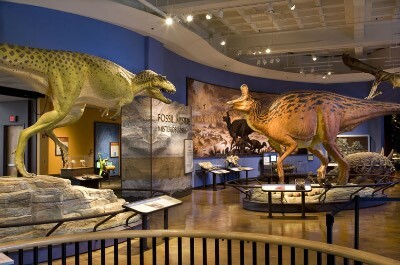 Our next recommended San Diego Museum is the spectacular San Diego Natural History Museum, a treat for the whole family. The Museum was established in 1874 and became Southern California's first scientific institution. It focuses on natural history in the regions of Southern and Baja California. You will be thrilled by the highly educational and interactive exhibits that make this a journey of discovery. Learn about the mysteries of fossils, the Dinosaurs and the Cerutti Mastodon Discovery. Watch amazing movies in the enormous 3D theater and then discover over 200 skulls from a wide assortment of animals. Tours and special events take place on a regular basis. From feeding rattlesnakes to exploring the Park after Dark and hiking in the Palomar Mountain State Park, there is something for everyone to choose from. You may not expect a touch of Spain in San Diego, but the Spanish Village Art Center will soon have you enjoying the Mediterranean vibe and culture on a great day outing. 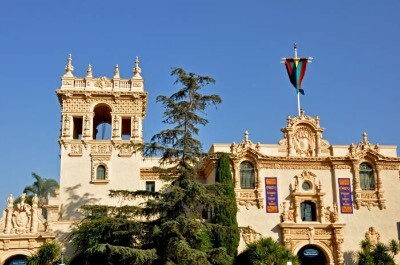 This art community is located inside Balboa Park and was established in 1935 for an event that needed to showcase an authentic Spanish village. After the event, travellers were charmed with the historic atmosphere, the architecture and the bright colored tiles of the village courtyard and it was preserved and turned into a living and working art community. Stroll around and watch artists at work, using mediums ranging from water color, to pastel, acrylic and oils. There are over 200 artists on the site with individual workshops and galleries to explore. Browse through the unique pieces and choose something special to take home. You can chat to the artists and even sign up for an art class. There are live art demonstrations and many special events that change regularly. Check their calender and make sure you don't miss this amazing San Diego Museum. Just when you think you have seen all the San Diego Museums, there is another one that cannot be missed. 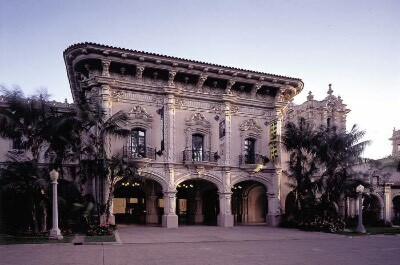 The San Diego Museum of Man is located inside Balboa Park and will take you on a fascinating journey through local and world history. Start by learning about the Kumeyaay Native Americans who inhabited this region in the 18th century when the Spanish settlers arrived. Very little remains of their settlements apart from what is preserved in the Museum. Explore artifacts from the world's ancient cultures and see mummies that have been transported from their tombs in the deserts of Egypt. Learn to read hieroglyphic writing and read about Mayan monuments. Art lovers will be thrilled to see the exhibits of artwork and pottery from Mayan tribes in Guatemala and kids will be delighted to learn about cannibals and how to live in the wild with animals. If you are fit, climb the 7 stories up a spooky hidden stairwell to the top of the California Tower. You will be rewarded will magnificent views of downtown San Diego. For those travellers interested in the history of this amazing city, a visit to the San Diego History Center is a must. It covers every aspect of the rich and long history from the original Native American settlers to the Spanish explorers who built missions in the region. Each event is depicted over a series of 2.5 million historical photographs that will leave you mesmerised. See how the city looked when it first began, learn about its military history, Naval bases and awe-inspiring ships. See textiles and hand made pottery from early residents. Art lovers will enjoy the collection of fine art on display. 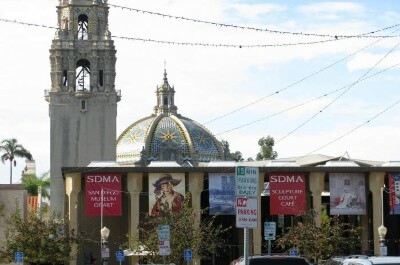 This San Diego Museum is unique, in that it tells the entire story of the city as you walk through the photograph-lined halls. Exhibitions change all the time, so you can visit again and again and always see something new. There are walking tours, fashion shows, adult programs, multi media presentations, musical events and collaborative events with other educational institutions. Make a day of it! 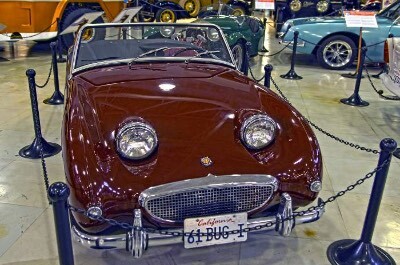 If you are a car fanatic head off to the fabulous San Diego Automotive Museum where you will be in your element exploring everything automotive from motor bikes to exotic cars. This San Diego Museum has both permanent and rotating collections that change on a regular basis, so you can visit again and again and always see something new. Be awed by the Harley Davidson collection of motorcycles and see the Steve McQueen exhibit. Then learn about a car that drove 6300 miles without stopping - the 1947 Louis Mattar Cadillac. There are over 80 fantastic cars on display and a huge collection of memorabilia. Explore the historic Plank Road, learn about Louie Mattar's fabulous car and let the kids take part in a scavenger hunt for trivia about different cars. A unique exhibition focuses on Japanese car manufacturing and another on ÔBarn Finds' - those lucky people who find a gem of a car hidden away in a forgotten and dusty barn! A great day outing for the whole family. Now for something spooky and spine-tingling! The Whaley House Museum is an old ancient house with a history of ghosts, hangings, suicides and other gory happenings. Perfect for an adult evening out, if you have strong nerves and enjoy the supernatural! The house was designed and built by Thomas Whaley who used bricks from his own brickyard. It features mid 19th century Greek Revival architecture and will delight those who are interested in architecture as well as ghosts. Now fully restored, you can stroll around and learn that it was once a general store, San Diego's first theater and a county courthouse. Guides are available to answer any questions you may have about the history of the House and its ghosts. Legend has it that the spirit of Yankee Jim Robinson haunts the house, he was hanged on the property before the house was built. The ghost of Whaley's daughter, Violet, is also known to roam through the rooms, she committed suicide here in 1885. 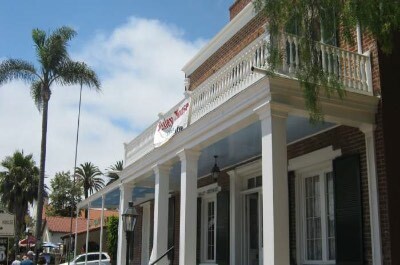 A ghost hunting tour at this San Diego Museum makes a fun night outing for a group of friends. Art lovers will be over the moon to explore the two venues that hold the collections of the Museum of Contemporary Art San Diego. 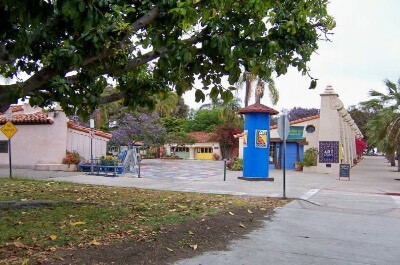 The first venue is located on 3 acres of ocean front property and the second is situated in downtown San Diego. Set off to explore over 4000 works of art, dating back to 1950. La Jolla on the ocean front also features the stunning scenic and colorful Edwards Sculpture Garden. Wander around and admire the sculptures and installations that are on display in the museum grounds. This garden makes a perfect spot to relax and if you enjoy drawing, take a sketch pad and pencil and spend a few hours in paradise! The down town location is set in the historic Santa Fe Depot baggage building. The exhibits offer a wide variety of genres from oil painting to sculpture, photography and video. See Pop Art from the 1960's and traditional art from Latin America and the San Diego / Tijuana region. A must for lovers of art! If your love of photography extends beyond snapping pictures on your mobile phone, you are in for a rare treat at our next recommended San Diego Museum - the Museum of Photographic Arts. Explore the history of photography through a comprehensive exhibition ranging from 1840 daguerreotypes on silver coppered plates to images of Russia in the mid 20th century and current day award winning photojournalism. There are over 7000 images to see from 850 artists Ð you will need to spend time here! When you get tired of walking around, relax in the movie studio and learn about the evolution of film from the start to date. Be awed at the Genesis Collection, a showcase of stunning photographs of the natural world, from polar glaciers to the vast savannah's. Then discover the 3D photography section called ÔSeeing is Believing' which is sure to delight the younger generation. You can even make your own 3D photo to take home as a keepsake. If you want to submit your own works of art, the Museum encourages you to do so! 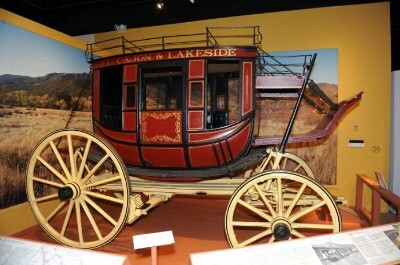 San Diego Museums cover every aspect of life and music cannot be left out! Located in Carlsbad off Interstate 5, you can be prepared for a day of humming and singing your favorite tunes. The Museum features an amazing collection covering the history of American music and instruments from the 1890's to the current day. 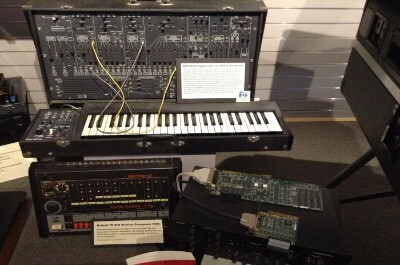 Start off and explore over 500 vintage instruments. Listen to and learn about all genres of music from classical Bach to Pop, Jazz, Baroque and Bebop. If you want to try out your skills, there are hands-on instruments for you to use. Understand how they sound in the hands of masters and then give it your best shot Ð you may even attract an audience! Live events take place all the time and are always changing, making this a venue that you need to visit more than once. See a show about Cole Porter, watch Lori Bell in action, celebrate Make Music Day and relax to the soothing sounds of a Jazz festival. This beautiful venue is designed to inspire! Do you know that over 100 athletes from San Diego have been featured on the cover of Sports Illustrated? Head off to the San Diego Hall of Champions to learn all about these amazing people and their achievements. 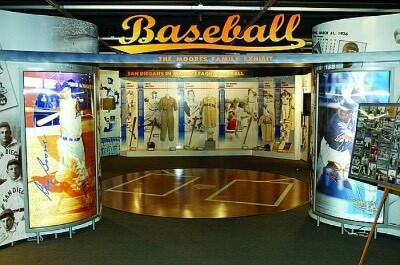 This San Diego Museum focuses on sports and sporting icons of the region. Learn about the history of the America's Cup and discover the story of each of the 100 athletes. From sailing to surfing, baseball and football, over 40 different sports are covered in a 3 story building, the nation's largest multi-sport Museum. This venue also holds the Breitbard Hall of Fame founded by the legendary Bob Breitbard who influenced sports in San Diego. This exhibition showcases and recognizes locals from the region who have excelled in the world of professional sport. Ongoing community events take place, check their calender for the latest exciting happenings. Looking for art with a difference? Set off to the fascinating Mingei International Museum which showcases all forms of folk art from over 140 countries around the globe. This captivating and colorful display makes a great feel-good day outing for the family. Explore a diverse collection of exhibitions ranging from beautiful hand made dolls to hand turned wooden bowls. Being in San Diego, surfing is the order of the day and the fabulous display of surf boards that explores the art of surfing is certain to delight you. See the display on horses and horse trappings and learn how fabric is woven from grass and leaves. Explore the world of exotic head dresses and traditional dance costumes. See ancient Chinese tools and magnificent Egyptian relics. The ladies will love the collection of knitted and crocheted flowers, wall hangings and beaded necklaces and the guys will be thrilled by the display of Tequilla bottles! 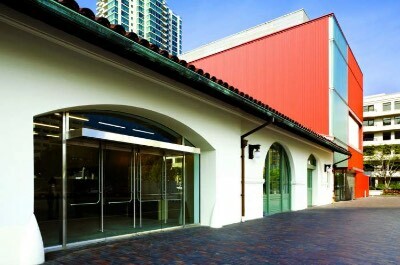 This San Diego Museum is a must for anyone who is inspired by creativity and vision! The exhibits here are constantly changing, showcasing the world's myriad cultures.